The old "white village" of Mijas is about 400 meters above sea level and commands spectacular views out to sea and over the resorts of Fuengirola and Torremolinos. Despite the influx of tourists, Mijas maintains a lot of its traditional Andalucian charm and really gets into its festivals and ferias! It has a huge array of traditional pottery shops, art galleries, and souvenir shops, which you can pop in and out of as you walk along the coble streets and take in the whitewashed houses and vista beyond. You can visit a few museums here and the bullring, which deserves a mention, has a museum in its own right. If stopping for lunch, try to get one of the restaurants that has views directly out to sea. Mijas also has some pretty well kept gardens too, near to the chapel, which are lovely and cool in the summer months. Not too far from the gardens there is an ice cream vendor - get the picture?! 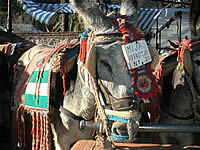 Mijas also offers its renowned Donkey-Taxis. You can hire these for a walk along the paths and tracks that surround the village. (NB. All the donkeys are now regularly inspected for their health by a local donkey sanctuary).